Welcome back to 2018’s edition of my favorite candles to light up this holiday season. Be sure to keep reading to the bottom to enter this year’s candle giveaway! 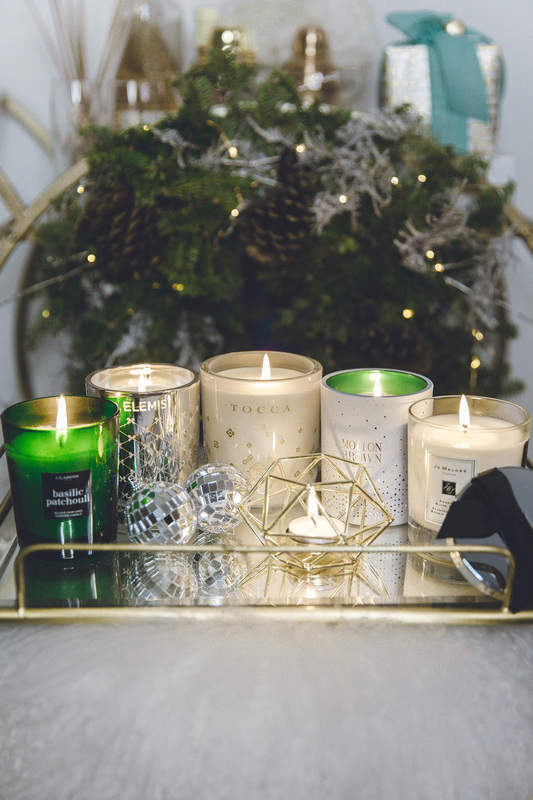 I’m so happy to continue this blog tradition and show you guys some new candles that made the list and old favorites. I burn an embarrassing amount of candles at home, so I’m always on the look out and shopping for more. As for the holidays, there’s nothing like scenting the rooms (especially the one with my tree) with seasonal favorites and old faithfuls. I find that these are the perfect additions to make your home cheerful and in the holiday spirit. They also are so beautifully packaged that it makes for the perfect gift. 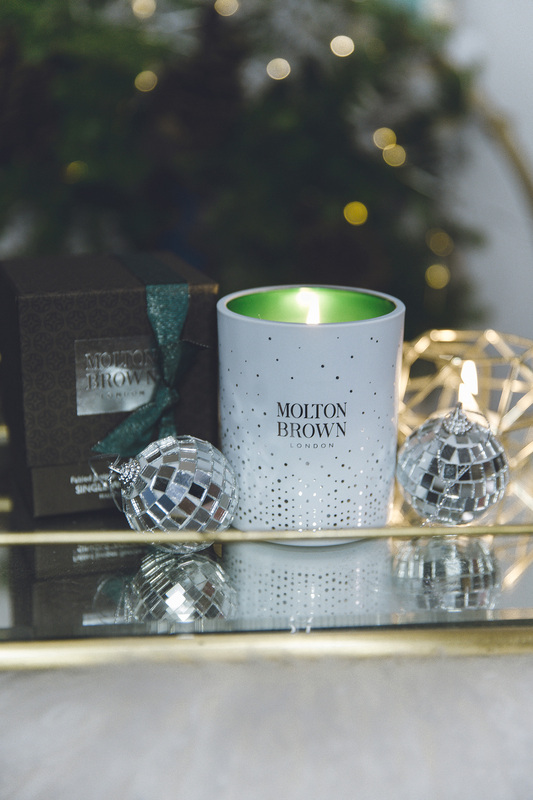 I’m so happy to rediscover Molton Brown this year! I love using their bath products in the past, and recently just tried their candle collection. The jar is full of sparkle — the perfect festive touch to anywhere you’ll place it. For the holidays I love the balance of juniper berries and lapp pine wood in this candle. 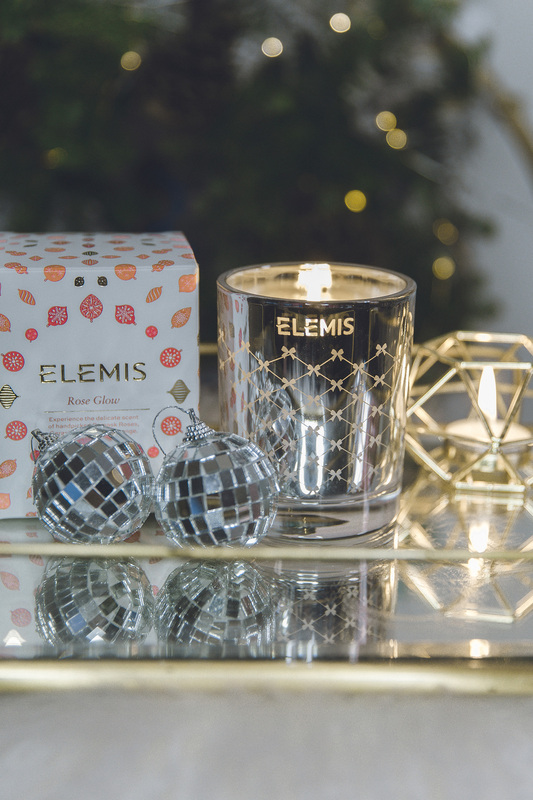 They also have two other festive scents; Muddled Plum for something sweeter and Festive Frankincense & Allspice for a little kick. This is more of a treat for myself. Leave it to the holidays to really indulge in yourself. It’s such an intoxicating floral scent yet grounded in suede. A popular favorite, it’s feminine and fills the room instantly. 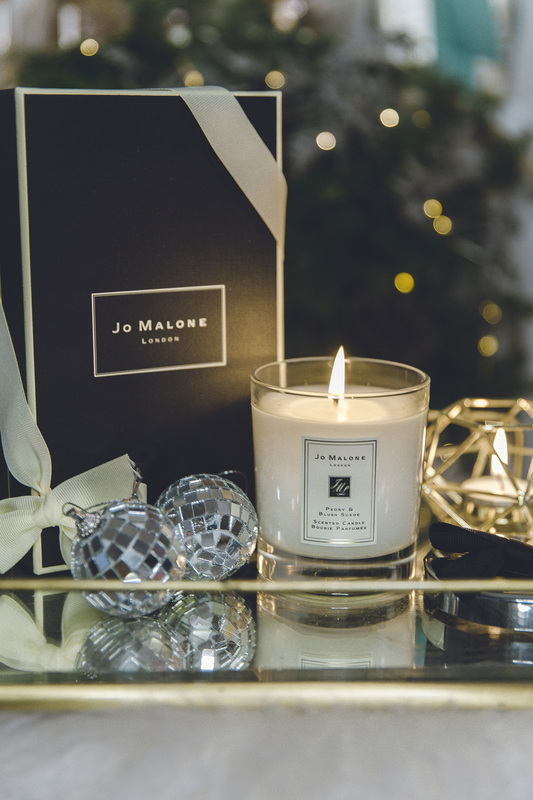 You really can’t go wrong with Jo Malone! Elemis may be my skincare fave but I just adore their holiday candle selections. The glass jar is so beautifully designed and matches my wintery holiday decor theme. So, here they are again this year with a new scent, the english rose, matching to the limited edition pro-collagen rose cleansing balm. They don’t disappoint with the two classic candles — last year’s fave, Joyful Glow (vanilla, cinnamon) and Soothing Glow (eucalyptus, lavender) for a peaceful spa-like atmosphere. I love it when skincare lines have candles! Notice a trend? 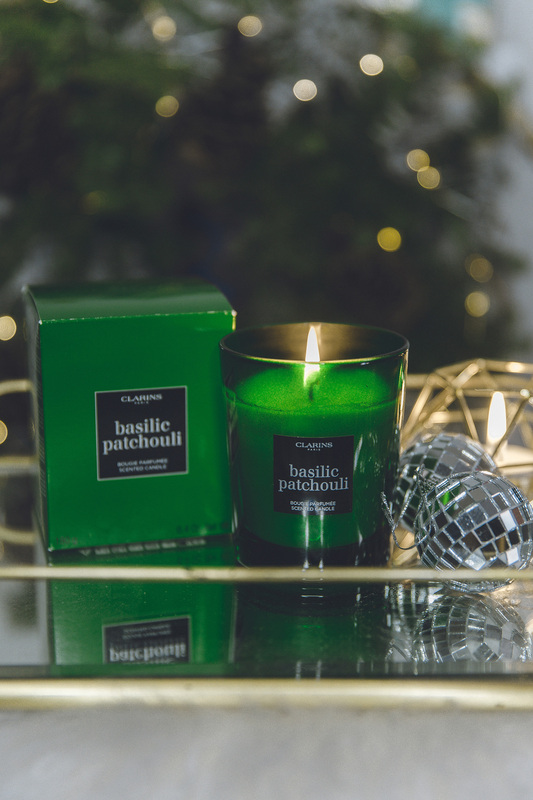 This is a more masculine scent of basil and patchouli in a green tinted glass that lends itself to festive decor though it can be used anytime. I love adding this in the bath room for its spa-inducing feels. Finally, I am bringing back Copenhagen! It’s such a feel-good scent of lingonberries and cedar wood. It’s become an annual favorite of mine. I find that I prefer this to other two holiday voyage scents — the warming Tahoe (vanilla, nutmeg) and wintry Chamonix (rosemary, pine). Plus, the packaging is absolutely gorgeous! It makes for such a great gift, which leads to the…. 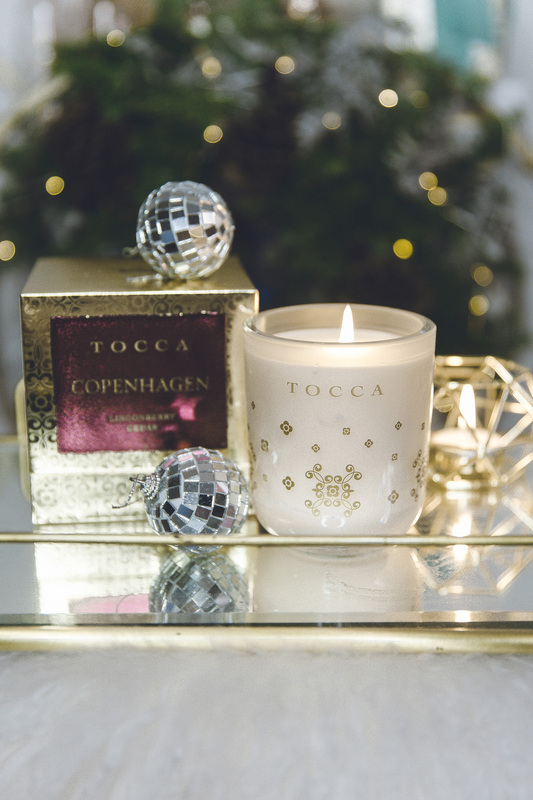 This year, I’m so excited to partnered with Tocca, to give away a Holiday Voyage (Copenhagen, Tahoe, or Chamonix) candles to one of you guys! A big fan of their candles. They burn so clean and smell SO Good! My favorite holiday activity is baking and decorating holiday cookies with my daughter. I love burning holiday candles and having a Christmas movie marathon this time of year! Add some fun pj’s, a fuzzy blanket and LOTS of Christmas cookies > I’m in heaven!! Nothing puts me more in the holiday spirit than lighting a holiday candle and writing my Christmas cards. Love to bake and share cookies. I like to ride thru the light shows. My family likes to decorate the house and then on Christmas eve bake cookies to leave out for Santa. My siblings now do this with their families. I love to bake cookies and listen to Christmas music. I love to bake and making my mom’s famous sugar cookies is a family favorite. I enjoy baking fot the holidays. Me too! I love watching the kids pull out the ornaments they have made over the years. My favorite holiday activity is singing Christmas carols and drinking hot cocoa.It just brings out the Christmas spirit in me. We always go out to dinner on Christmas Eve. My favorite is Christmas Dinner with the family. I love to decorate inside and outside. The more lights the better!! I love decorating and baking. we love to look at lights ! My favorite thing to do during the holidays is baking with my family. Baking & candy making day with my nieces, followed by a Christmas light tour! I like to go sledding. I love baking holiday treats for my friends and family this time of year. Ice skating is my favorite holiday activity! I love to bake cookies during Christmas with my five year old little girl. I love baking during the holidays! Shopping is fun, too! My favorite holiday activity is to decorate the Christmas tree and house. I love reading Christmas books to my nieces. I love to decorate the house. My favorite Christmas activity is cooking. I love baking during the holidays. My favorite holiday activity is doing a lot of baking. I most love going to the lighting ceremony with my babies. My favorite holiday activity is decorating our Christmas tree, my least favorite is un decorating it. i love white elephant parties ! Having the family over for a big dinner. We like driving around looking at the Christmas lights in our neighborhood/town. I enjoy all the Christmas lights. Christmas dinner is my favorite activity. I love going to see the lights on Christmas Eve. I love the wrapping…spend as nuch time wrapping each gift as I do shopping for it. Favorite holiday activity is baking cookies. I love baking snowball cookies. My favorite holiday activity is baking. I love baking and decorating for the holidays!!! I love baking cookies and watching Christmas movies. My favorite is baking cookies with my grandsons. My favorite holiday activity is baking Christmas goodies. I love hunting for stocking stuffers and opening stockings. I love playing games with my family and friends and watching holiday movies. I love baking cookies and then watching holiday movies while enjoying the cookies! My favorite holiday activity would be to look at the different lights on display and view the creativity and hard work that goes with all of the different lighting displays. Haven’t tried Molton Brown candles yet, but its scents sound awesome. Oh! And I love making cheese fondue for the holidays. It’s a Christmas Eve tradition for my Norwegian family! My favorite thing to do during the holidays is read by the beautiful Christmas lights (including candlelight)!